Our Party Packages include tables and chairs to seat the number of people in the package title, and the tent to put them all under! All you have to do is provide the guests! Delivery rate additional. This package includes installation of canopy only. Tables and chairs are delivered and picked up only. For table and chair installation, please see the Tables and Chairs category. 7' tall sidewalls can be added to this canopy. Sidewalls may be found under the "Tent Accessories" catagory. 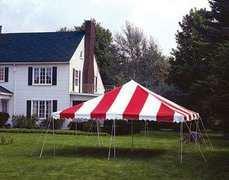 We recommend 2 sets of globe lights to light this size tent. Globe lights may be found under the "Tent Accessoreis" catagory. We recommend 4 sets of globe lights to light this size tent. Globe lights may be found under the "Tent Accessoreis" catagory.